If you were to have a conversation with my mother about the way kids are being raised today chances are that before the chat ended she would have told you two illustrative stories. Both of these stories sprang to mind as I read this article on The Huffington Post about the lost art of children’s play. It calls out eight key benefits of unstructured play (among them: creativity, initiative, emotional skills, decision making, independence, and physical activity). They are traits that I doubt many parents would suggest are unimportant. Likewise I doubt that many parents would contradict the premise that these traits are fostered by unstructured play. And yet, unstructured play in this country declined 25-45% (varying by age bracket) between 1981 and 1997. It’s been nearly 13 years since we closed the door on 1997. So how is it, then, that we continue to fight these battles? Granted I’m still a relative rookie in the child-rearing business, but what I lack in experience I work to make up for with education. And I’ve yet to read a study or article stating “American kids have too much free time and should be involved in more activities.” But I’ve read the opposite so many times. Every parent wants the best for their child. It is a commendable (if generic) position to take. But the fact of the matter is that most of our children will grow up to live average lives. (And that’s okay!) Further still, with a cruel twist of irony it’s possible that the people who were given the most “advantages” as children (in the way of pee-wee sports, music lessons, tumbling classes, and the like) will actually find themselves disadvantaged in the adult world due to a lack of imagination, initiative, and coping mechanisms. Given all of this, I wonder why some parents still enroll their kids in the rat race as infants and toddlers. I wonder why other parents feel the need to explain (or hide altogether) the fact of their children’s less programmed lives. There’s an argument to be made that the “under-scheduled” will actually be better positioned to succeed than the “over-scheduled” one. So when will the stigma die off? I’m currently reading Barack Obama’s first book (the one that was written before he started running for things; the one that was written with candor and searching and vulnerability). And while it hasn’t been a complete surprise to me (because it was beaten to death by the media during his presidential campaign) I have nevertheless been struck by the extent to which his youth was unsupervised and unguided. He was taught to value intelligence and education, but most of the rest of his worldview he pieced together on his own. And I am prone to wonder to what extent that freedom was a catalyst for his success. Yes, he is a sample size of one. (So is George W. Bush, whose nearly opposite upbringing led him to the same professional pinnacle. These correlations are not incontrovertible.) But I suspect that spending his adolescence grappling with his own ideas left him with a belief system that was rooted in careful thought and consideration; a cache of beliefs that he could articulate and defend. Perhaps it is quite a leap to jump from an unstructured childhood to the White House. I suppose my point is that nothing is guaranteed. For every Barack Obama there is also a JFK. And for JFK there is also a JFK Jr.
We all want the best for our kids. But I think it’s about time that we gave them their childhoods back. Some structure and instruction is certainly good, but too much of it robs them of many other good things. As adults we make up the rules and laws that govern our lives. It seems to me that a made up and self-refereed game on a playground is as good a practice round for life as anything we adults could structure on their behalf. This entry was posted on Monday, December 20th, 2010 at 8:02 am	and is filed under Childhood, Choices, Culture, Parenthood. You can follow any responses to this entry through the RSS 2.0 feed. Both comments and pings are currently closed. I think the issue of structure vs. freedom is one each parent struggles with. We may start out with one stance, and as time goes on (and our kids teach us what they need), our position changes. I, for one, am happy my kids had relatively few activities when they were little. It gave them more “kid” time – and I think that’s essential. They’re teens now, and very responsible and hard-working, but they still take their kid time. I think it’s the way all of us can stay a bit grounded in a complex and competitive world. Adults would do better to take their own kid time. 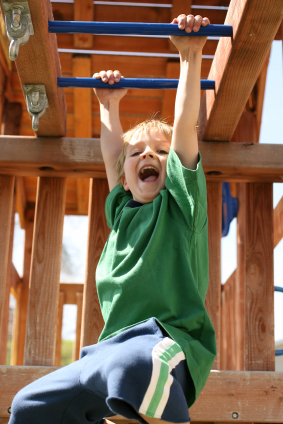 First let me say that I agree – kids these days need less structured time to do free play. However, I read that article and I really question the validity of some of the assertions the author makes. For example, where does this “25-45% decline” come from? Anytime an article states studies, it is important to consider the source of the study, none of which is mentioned. This guy is a doctor – he should know better. I mean really, where did this study come from? Another thing I disagree with is the whole video game is not free play. I beg to differ. My sons play live against (or with) other people and it is incredibly social. There is problem-solving, cooperation and just plain fun. I agree that the kids should do other things too – and they do. Everything in moderation – but my point still is that I disagree about it not being free play. Another point where I disagree with the author is that play dates are not considered unstructured. I’ve been in this parenting business for 15+ years so far and I have never encountered a structured play date. It’s always been free play. Maybe I’m odd, but I have three boys and never had a structured play date. I do agree that the dangers associated with unsupervised outdoor (away from home) play have been greatly exaggerated by the media. And, I think that this has resulted in kids being kept indoors more than necessary. For me and my kids, I’ve noticed that each one has successively been less structured – and the youngest is the one who can play on his own for hours. The oldest is constantly “bored” with “nothing to do” which leads me to believe that there is some validity to the whole structure killing creativity idea. Anyway – long and rambling, but while I agree in general with the concepts the author is promoting, I am highly suspect of his citations and beliefs behind his assertions. 1. Studies – This is probably a fair point. I, not being a research psychologist or doctor, didn’t delve into the the validity of the study. Although perhaps I should have. I didn’t question the statistic because it seems to uphold what I have observed anecdotally in real life. 2. Video games – I can’t comment here because when I was a kid my video game interaction was the original Super Mario Brothers and that’s it. I played against the game. It did not foster creativity, strategy, cooperation, or communication. It did foster my sister and me staring at a screen for long periods of time and getting into fights when I would pause the game with her Luigi character mid-jump so that when I un-paused it he would fall into a cavern and die. (Classic big sister move…) I know that today’s games are much more versatile than what I played, but they still impose a great deal more structure than true free play, right? 3. Play dates – I’m with you here. As a kid I had what would today be called play dates all the time. We called it, “Mom, can I invite Jenny to come over after school on Wednesday?” Given that Jenny and I didn’t live within walking distance of each other this meant that someone (moms!) had to provide the wheels. Once we had been shuttled home and fed an after-school snack we were left to our own devices. 4. Media Sensationalism – I actually posted about this back in September. It’s hard to tune out the message of doom that is disseminated by the media. But I have to remind myself that there’s a better chance that I thwart my kid’s childhood by cooping him up at home than there is that he’ll be kidnapped because I let him walk three blocks to a neighbor’s house. 5. Interesting that your kids are progressively less structured, and that your experience shows correlation between structure and creativity. Thanks again for your comments here. As a human parent I’m sure I’ll find new and inventive ways to screw up my kids , but hopefully I’ll walk the appropriate line on this one. Well, I think I’ll take this one from the child’s perspective…I just loved unstructured play, plain and simple. I was often in la la land, but I loved it there, and wouldn’t trade my aimless afternoons on a bicycle for some scheduled class for anything in the world. However, I think you can take it too far, as you can with the scheduling as well. If a kid shows a strong interest in something and a scheduled lesson or group is the best way to facilitate that, then I say let kids try whatever they want. In moderation, of course. Oh, and that was SOOOOOO rude when you did that to Luigi (and me). Not to mention the fact that I ALWAYS had to be Luigi. Seriously. Scarred for life. Aidan – Exactly! “Veggie Booty Soup” is exactly the kind of invention that only comes from unstructured play. I love it! I am a HUGE proponent of unstructured play, both for my own children and as a professional suggestion to client’s and their children. I don’t know how many times a day I tell my son to “just go play” when he asks to watch a cartoon. And because of my constant refrain, he and his 1 year old sister, have so much fun, and are SO creative in their play. (example, we currently have two large boxes that have been converted, upon request into a “house” and a “garage” to which they both color on and in throughout the day! I love it!) I feel that one of the greatest gifts my mom gave me growing up was pushing me and my sister outside to play and very little TV! I think this focus led us to be creative thinkers and conceptualize “outside the box” even into our adulthood. GO PLAY! Whenever I read about studies like this one, I feel grateful that I live in a small, rural community where opportunities to schedule my kids’ time are few and far between. As much as I enjoyed my own childhood and all of the unstructured play that came with it, I wonder how I would react today if we lived in a place where keeping kids “active” seems to be part of a larger culture of competition. I suspect that I would feel the same way, but would have a harder time acting on my feelings than I do here. The video game thing – Like Cathy’s kids, my boys didn’t play video games in isolation. It was always a rollicking (noisy) group activity – certainly play time, certainly social. And neither video games nor technology ever kept either one from being creative or picking up a book, either. I will say – I watched other parents schedule their (little) kids for more activities than I would ever want as an adult! I also watched as (some of) these same kids rebelled as time went on – really envious of their friends who didn’t have a required activity 5 days/week. Their “kid” time? They had precious little of it, and they knew it. My favorite stories about my kids always arise from time when they are enjoying free play. So I completely agree with all the comments about unstructured play. We have engaged in a few structured playdates – took M and her friend to Build A Bear (I had a gift certificate and a coupon); let M and her friend make those bejeweled jewelry boxes because she got 2 for her birthday and 1 is more than enough for our home, but for the most part playdates are unstructured. I have to tip my hats to the lovely teachers at my children’s early childhood center. The kids are outside twice a day for at least 30 minutes each time (the kids go outside more than I would ever take them out if I was a stay-at-home mom!). Also, the center’s educational philosophy is child-centered, play and project based learning. There is no teacher telling the kids to put that cotton ball on a particular spot to make that bunny cutout have a perfectly placed tail. When the kids get interested in a particular topic, the teachers go with it and use that topic to get the kids working on fine motor skills, gross motor skills, language skills, problem-solving skills, early math and reading skills, etc. While there is structure in that there is order and not chaos, there is a lot of non-structure and freedom in this educational philosophy. It’s just awesome. Now that M is in elementary school, there is TONS of structure. They have to hit the ground running for those kids to show adequate yearly progress (thanks to No Child Left Behind). Her recess is only 15 minutes, and her lunch only 20 minutes. When the kids are in the halls or in the bathroom, they can’t talk. I don’t recall silent bathrooms when I was in elementary school, but my memory may be flawed. So how does my child transition from the very fluid, child-centered learning of her early childhood to structured public elementary school? It was seamless! I was astounded. Because the child-centered project-based learning instilled in her a love of learning, the structure didn’t phase her. She basked in all the new opportunities to learn and she soaked it all up. But I completely give credit to our early childhood education center – which allows the kids to be the kids and didn’t try to teach them to read at age 4 (as if that’s a good thing). So while I admit to a few structured playdates and to some weeks when I feel a little bit like a taxi between dance, Girl Scouts, swimming and religion school, I am a proud non-flashcard bearing mama of sprited, imaginative, creative, funny and book loving children.